He mentioned that research had shown that one could end up with a permanent or semi-permanent shutdown of the HPA axis (hypothalamus-pituitary-adrenal) due to these kind of injuries and it makes sense. The HP part of the HPA are part of the brain region and undoubtedly vulnerable to concussions. The research shows that some men experience a transient loss of hormones; still others take a year to four years to recovers; and still others never recover. The classic example of this are the athletes in the NFL with widespread depressive, neurological and psychological issues. Does anyone believe that these ex-athletes do not have massive HPA disturbances? Many guys wonder, "Where did my testosterone (and/or thyroid hormones) go?" Well, perhaps it stems back to concussions incurred during competitive sports or a car accident or an accident in the home. If so, then I recommend reading my Links on the Brain, Learning and Memory. The interviewee below mentions an anti-inflammatory diet and HRT (if appropriate of course) as well. NOTE: Please also see my page on CTE and Brain Damage in Young Men. CTE is showing up in amateur, high school and college athletes now! GUEST INTERVIEWEE: Anix from The Peak Testosterone Forum. Q. Can you explain a little bit about your background, such as how many concussions you had and over what period of time? Also, did you have any concussions back-to-back within a two week time period? I've had 15 severe concussions, and half as many subconcussions. I never had concussions within a 2 week period. So that eliminated Secondary Concussive Syndrome. Q. What made you keep going? Obviously, no one thinks a concussion is good for them, but I assume you thought it was like a broken bone that would heal? A. The male condition. My ego. No science and data to say mellow out. Plus my grandfather was 1 HW boxing contender in the world almost beating Joe Louis, and most of the fighters that beat the Brown Bomber. Falling down snowboarding hard seemed girlish in my mind. 'get up walk it off'. In hindsight a stupid approach. Q. What made you stop professional sports - I assume it was the concussions? And when did you notice that they were causing you issues? A. Got old, as I say my ghost walked out of me my last severe one. I literally knew I was done. That one I lost my sense of smell and taste, and could fully see out of my right eye for a while. I lost my fight. When all you are doing is sending over huge transfers, cliffs and jumps, its scary. Even to the best. You need to have that fight. It left me because I knew I was wrecking myself. Q. What symptoms did you develop as a result of the concussions? Did things just get worse and worse? A. Once day I woke up, @1997 said I dont feel good. Had raw anxiety, felt super depressed. Stayed inside for 3 days blinds closed. Felt like I hated the world, needed to isolate. That was the first one. Those periods became more frequent and longer. Q. Were the doctors helpful initially? What were their solutions for concussions? A. Nope they are totally neanderthal about it. Dont fall asleep, take an xray. Completely ignorant. Q. How long did you suffer with these symptoms until you got some relief? Q. You mentioned in a post that a girlfriend essentially saved your life? Can you explain a little more? A. She works in fitness, is a very high profile one. Works with Victoria Secret models etc. Very smart woman. Told me the diagnosis of Bipolar wasnt making sense. She got me comprehensive blood panel. It was a mouth dropper. Q. You have also discussed on the forum how concussions can shut down the HPA axis? Can you explain a bit more what you have learned? A. Well first off I am no Dr but Ive metaphorically mentored alot of people in discussion and seeking help. Basically I simply tell people this. The brain=computer and respective USB cable get broke which communicate to the thyroid, hypothalmus & pituatary glands, and of course the gonads et al. The cables are broke. Data points, info whatever you want to call it are being sent but the USB cables are not performing. Subsequently the computer stay in sleep mode. Hopefully that works, a technical explanantion is more easily found on line, but in laymans terms thats accurate IMHO. Q. So how has HRT improved your life? Can you give a brief description of your current protocol? A. Its the standard fair. My dosage is rather high, but Im learning it could be due to a couple things. Honestly I hate the needles, the cost, the stigma. But it has saved my life. The nandrolone is for joint pain I was getting, has gone away. Firstly my mental emotional stay is 85% better. Physically I changed but I work in fitness, CrossFit and after having near 10 years of my life robbed from concussions I dont take it lightly. Im in it to win it. Physically Im fitter than ever. Funny I never noticed that all my training before yielded zero results. Now commensurate with my work I put in Ill notice the results. Q. I know you've talked a lot to various athletes and doctors about concussions and their health effects. How many concussions or how frequent or how hard of concussion does it take to sustain permanent HPA damage? Are you seeing any guidelines forming out there? Or is one all it takes? Q. Many, many men out there have sustained multiple concussions in sports, in the military, etc. 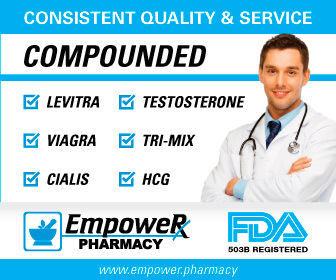 Besides testosterone therapy if appropriate, what other treatments are available and seem to help from what you have heard? A. Well the military deal is a whole other dialogue. When our armed forces are firing ordinance those things create micro concussions. There are quite a few reports and studies discussing the matter which can be found via a search engine. I know the military has reported to be observing what happens and maybe some science or study will come from it. I have massive respect for our servicemen they deserve to know if it is. These concussions and the legacy of symptoms they can leave dont wash off. Q. Do you have any organizations or sites that you'd like to mention for men that want to find out more information? A. Honestly the most important organization there is... YOU. the patient. Know your health. READ. Establish what the consensus of science says. Dont deify or god complex your Dr's. They dont give a shvt. Excuse the language but they treat symptoms. Know how to eat an anti-inflammatory diet. Understand what neuroplasticity means. Love yourself. Love the life you have. Communicate to your inner circle. And dont give up. The Sports Concussion Institute is good. My friend Kyle Turley former NFL athlete is at the forefront of pushing for better treatment of the NFL and its athletes. And of course I run a small wellness company on optimal living, fitness, & performance in southern California. Thanks for raising awareness to this. I feel it has more to do with how many men have messed up endocrine health than we are lead to believe. 2) The Journal of Neuropsychiatry and Clinical Neurosciences, 2007;19:363-372, "The Neuroendocrine Effects of Traumatic Brain Injury"